Who’s up for a 200 word piggy back ride? 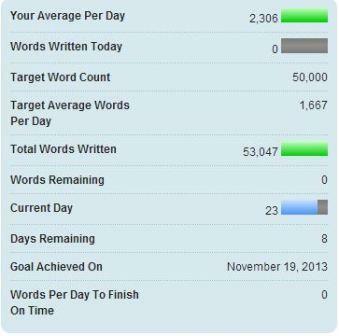 Here are my latest NaNoWriMo stats. It lies about how many words I’ve written today. I just haven’t added any more words to my NaNo project. I finished NaNoWriMo Tuesday, and guess what? I haven’t stopped writing since! Today, I am joining a writing challenge hosted by Chuck Wendig over at the TerribleMinds blog. It’s a five part challenge in which participants will collaborate to write several flash fiction pieces 200 words at a time. To participate, this week you should write the first 200 words of a story and post it to your blog. Then head over to TerribleMinds (where you can also find full details of the challenge) and share a link to your post. The next week, you will choose another author’s first 200 words (maybe even mine!) and write the second 200 words of that author’s story. The following week, you will choose yet another story and add an additional 200 words of your own, and so forth, until you have written a total of 1000 words on 5 different stories. What do you think? This was my first attempt at flash fiction, and it was harder than I thought it might be. The story came out easy enough, but stripping it down from over 600 words to 200 was a challenge. It helped me figure out which of those words were most important to me. I hope one of you will choose to continue my story, as I can’t wait to find out how it ends! If you do, please come back next week and post a link to your story in the comments below. Good effort for your first flash fic. I really like how well you’ve done with leaving it open for another writer. Thanks! I hope someone picks it up so I can find out how it ends! Hi Amanda – I had a go at Making Merry. Hope you like it. I just read it, and it is awesome! Wow, thanks! I’m a novice, that’s great encouragement. 🙂 Thank you! Latest version of Making Merry: http://article94.blogspot.com/2013/12/making-merry-part-4.html?m=0 All it needs now is an ending!